I am not the hugest fan of breakfast as a meal but I am well aware that it is super important to eat a good one and start your day off right! I’m a little bit of a nut and I’m currently doing a cleanse and that means clean eating all the way. 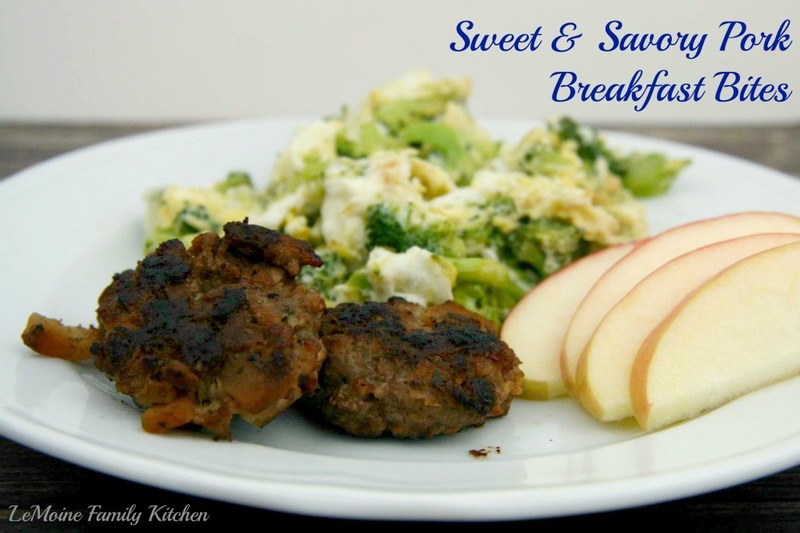 Over the weekend I made a batch of these Sweet & Savory Pork Breakfast Bites to have on hand for the week. They are super tasty and much better for you then the super salty breakfast sausages in the frozen aisle. I mixed up lean ground pork, 1 apple, poultry seasoning, honey, garlic, salt and pepper. These are formed into bite sized patties and baked in the oven until golden and cooked through. I absolutely love the sweetness from the apple and honey paired with the pork. The seasonings, you likely have on hand already, and add great flavor to the mild pork. I served them yesterday with some egg whites and broccoli and apple slices. Another fun use for these is to chop them right up into an omelette. These freeze great too so you can make a nice big batch, refrigerate enough for the week and freeze the rest. To reheat, pop them from the freezer right into a toaster oven, or your regular oven. Preheat your oven to 385. In a small frying pan, over medium low heat, add the apples and water. Cook until slightly softened. Stir in the seasonings and honey. Cook for a few minutes. Remove the apples from the heat and allow to cool completely. Once cooled, mix together the pork and seasoned apples until evenly combined. Spoon out by the tablespoon onto a lined baking sheet. Bake for about 12-15 minutes, until the pork is golden and cooked through. Bet the kids will gobble these up! Yes! Its nice to make your own bc besides the frozen kind having lots of salt, they seem to all be super peppery!